Teachers who prefer to create their educational presentations with PowerPoint can export them to Keynote on the iPad when needed. Teachers often prefer PowerPoint because it is feature rich and they are used to it. These teachers who have been giving presentations for years and using PowerPoint often look for ways to migrate those presentations over to Macs and iPads. Luckily, if you’re in that same position, you have several options, including Keynote for iPad. If you have a simple PowerPoint file, you can often open it directly in Keynote. It’s important to stress here however, that it needs to be a pretty simple PowerPoint presentation. Some functions won’t translate — including complicated animations, embedded fonts, branching and linking within the presentation, image editing done in PowerPoint, embedded video, and more. If your presentation contains those functions, you’ll see an error similar to the one shown here. If you aren’t using any of those functions, this may be the easiest way for you to display your PowerPoint presentations on the iPad. Upload the presentation to a cloud storage service such as Dropbox, e-mail it to yourself, or sync it via iTunes to move the content over to your iPad. 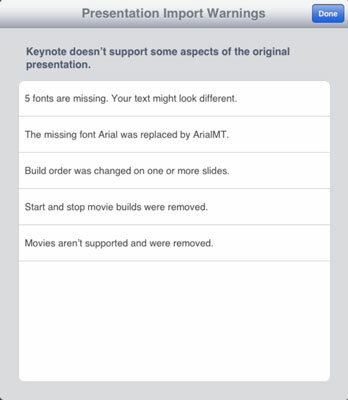 Whatever app you’re using to open it should have an Open In option that offers Keynote as an option. If your PowerPoint does not open in Keynote properly, you have other options such as creating a PDF file and using a PDF reader such as GoodReader, or using a different app to present your PowerPoint presentation, such as SlideShark.